The Personal Best Academy in association with JPS Combat Fitness are excited to introduce our NEW! MMA (Mixed Martial Art) classes at the PBA Fight Factory, under the expert tuition of Martial Art Champion & Coach Jake Shore. Coach Jake Shore is the Head Coach at JPS Combat Fitness, WFMC GB Light Continuous Kickboxing Coach and former ISKA England MMA Coach. He has trained over 10 World title holders accross various disciplines and organisations. He was the 2016 WFMC Kickboxing World Champion and 2012 ISKA MMA World Championships Silver Medallist. 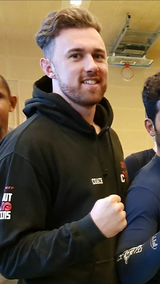 With 17 years experience in Freestyle Kickboxing (points and continuous) and 10 years experience in MMA, Coach Jake Shore now shares his expertise & knowledge and enjoys training people of all levels, ambitions and ages. Coach Jake Shore will be teaching MMA Classes at PBA Fight Factory on Tuesdays and Thursdays at 6.30pm. He is also available for private tuition at flexible times (1 to 1 or up to groups of 6), school bookings and corporate team building. NEW BEGINNER CLASSES ARE NOW FORMING!! Call our team today to secure your place and take advantage of our no obligation FREE Trial!